Due to unforeseen orders leading up to Christmas, all reed diffusers are out of stock until the end of January or the beginning of February 2019. We apologise in advance for any inconvenience caused. The quintessential Christmas scent! Inspired by the author Alexander McCall Smith, we tried to create a scent that would inspire creativity and guide you through your imagination. The Writers Nook is a spicy and evocative scent of cinnamon, orange zest and clove. We wanted to make a scent that took everyone back in time to cosy, candlelit winter evenings, reading in front of an open fire. Our Émilie du Châtelet scent is a fresh and fruity perfume with notes of freesia and pear. It is a wonderful scent to welcome a new Spring. Lex named it after reading a biography of female mathematicians and Émilie du Châtelet was a truly inspiring woman, whose character jumped out of the page. She was not only a gifted mathematician but also a physicist, philosopher and author of many acclaimed academic texts. The philosopher Voltaire was one of her lovers and once wrote of her that she is “a great man whose only fault was being a woman”. There have been and are, many great female scientists achieving insights into science and philosophy in the last 300 years but unfortunately things have not changed all that much and we tend to just hear about the great discoveries of their male counterparts. Our Mizaru scent is named after one of the The Wise Monkeys. Thought to originate from Japan, the pictorial maxim conveys the proverbial principle of See No Evil, Hear No Evil, Speak No Evil. Sandalwood is deeply rooted within many Eastern cultures for both medicinal and religious uses. The sent of Sandalwood is extracted from the base of its trees. Sandalwood trees are endangered due to their high demand. In Nepal and India Sandalwood trees are government-owned to protect them but the trees are often stolen and sold illegally. As we do not use essential oils we are not damaging the dwindling numbers of Sandalwood trees in the world. Our perfumers use molecules to replicate the scent exactly. Mizaru is our unisex perfume. Our Orange Blossom & Magnolia scented products are named after the great Roman poet and philosopher Ovid. Enjoyed by international singers, actors and sporting champions, our Ovid is a delicious blend of spicy orange blossom and light misty magnolia to symbolise purity of heart and love of nature. Orange Blossom infuses its citrus scent into food deliciously. The Spanish often use it to make tea. Blended together, orange blossom and magnolia produce a scent that is so distinctively floral yet with strong undertones of bitter sweet citrus. Opoponax is used as a base note in our perfume Cupid. Songbird is a beautifully fresh and distinctive blend of sweet wild berries and freshly cut roses. Songbird symbolises protection, poetry and love. One of our most popular scents! Tuberose is used as a base note in our perfume Cupid. A Jokoban, meaning The Constant Incense Board, is an ancient and ingenious form of timekeeping. As the hour changes so does the scent. Jokobans are skillfully handcrafted, lacquered, wooden boxes. The Japanese traditionally burnt Agarwood, Apricot or other native scents but AetP have chosen Rose Geranium for its fresh yet romantic and powerful scent. Rose Geraniums symbolise love and hope. Available in Candle, Eau de Parfum and Reed Diffuser. 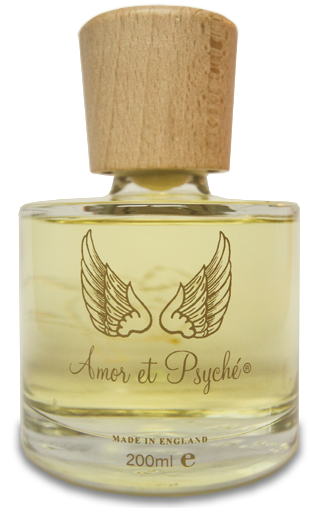 Amber is used as a base note in our perfume Cupid. Bergamot is a top note used in our perfume Cupid.